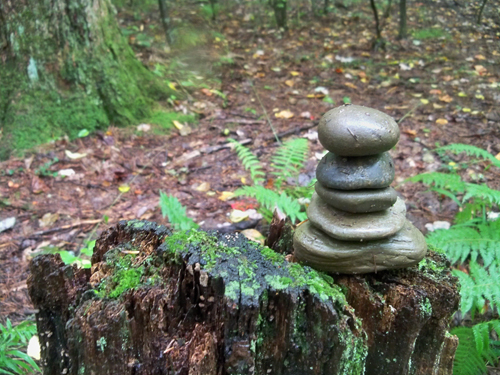 Stacking rocks in the woods. That is a great hobby. 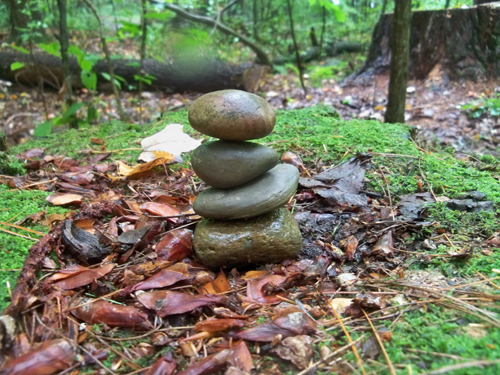 I wish I had woods as beautiful as yours to stack rocks. For those of us that were spooked by Blair Witch Project, it would shake me up a little to see that in the woods. You weren't in Black Creek Park recently, were you? Saw something just like that there the other day. Another Andy Goldsworthy in the making! we made inuksuit rock signs like these with the kids at a UU church recently! it was more satisfying than I could have imagined. I see that a lot. What does it mean? Is it just a zen thing? They look really pretty but the first thing I thought was . . . . Blair Witch. I'd have freaked out a little if I'd seen that.